Use LICENSALE.COM® to reduce your working hours. Managing medical device registration processes with LICENSALE is significantly more efficient than other practices. Compared to a distributor or local consultants, it only requires 25% of the working hours invested in obtaining a market clearance. The more you use LICENSALE, the more simplified your future regulatory applications become as the system utilizes previously supplied information. It manages a more substantial portion of the application preparation, minimizing redundancy. Reduce time spent preparing submissions to accelerate time to market. The more you register the less you pay. LICENSALE.COM® provides fixed price model* which allows you to plan your budget and avoid unexpected costs. The more products and markets you add to your plan, the more you qualify for lower, discounted rates. *for most of the markets LICENSALE registers in. 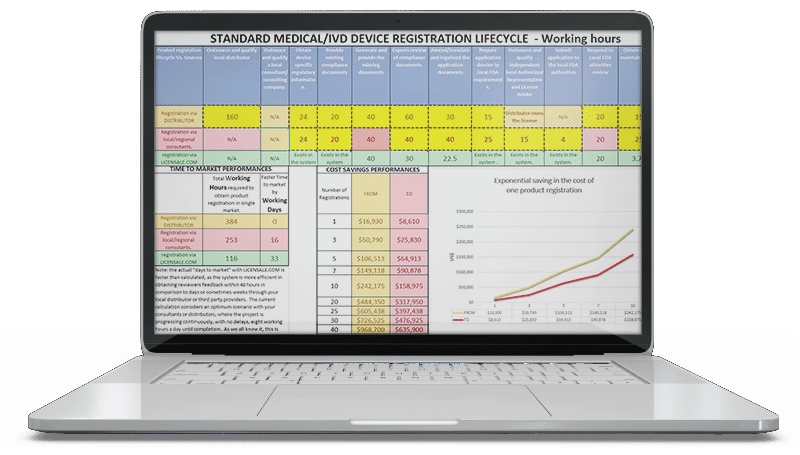 How much could you save on your medical device registrations? Download the MedTech Product Registration Calculator to examine your global registration costs and time to market using Licensale.com®, distributors or a local consultant. Compare your current regulatory practice to Licensale.com® to see your potential savings and additional revenue. How is the LICENSALE.COM process different? How Could LICENSALE.COM® Help You Beat Your Competition? “We were very excited to receive our 510k clearance for the SAAD patient monitor months earlier than anticipated with Arazy Group. Arazy Group went above and beyond for this project and we are very happy with the result, which marks the first registration project of its kind in the USA and EU.” – Rudolf Holzhausen, PhD.